Tsentral (Централь; full name:Центральний український сільсько-господарський кооперативний союз; Tsentralnyi ukrainskyi silsko-hospodarskyi kooperatyvnyi soiuz [Central Ukrainian Agricultural Co-operative Union]). A co-operative association established in Kyiv in January 1918 to represent agricultural organizations and co-operatives throughout Ukraine, supply them with farm machinery, equipment, and fertilizers, organize a distribution system for agricultural produce, and promote associations for the joint cultivation of land. The Kyiv Central Agricultural Society (est 1915), which had been run by Petro Pozharsky as president, Volodymyr Koval as vice-president, and Rev T. Dobriansky as a member of the executive, was the predecessor of Tsentral. The Tsentral congress at the end of August 1918 elected an executive of Koval (president), K. Shemetiv, O. Filipovsky, Mykyta Shapoval, Oleksander Mytsiuk, and Viktor Domanytsky (secretary) and a board of directors headed by Kost Matsiievych. By July 1919 the union represented 41 co-operative associations and 728 individual co-operatives. Its assets increased from 5,400,000 karbovantsi in January 1918 to 21,148,000 karbovantsi in January 1919 and 147,707,000 karbovantsi in October 1920. It maintained offices in Odesa, Kharkiv, Poltava, Katerynoslav, and Vinnytsia. In the summer of 1918 it acquired a large plow factory in Odesa and owned several sawmills. Tsentral's organ was the semimonthly Sil’s’kyi hospodar (Kyiv), published in Kyiv in 1918–19. 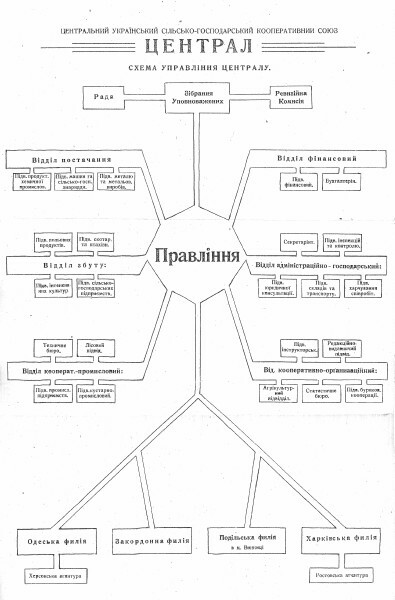 In 1920 the Soviet authorities abolished all independent co-operatives in Ukraine, including Tsentral. In 1922 they set up the government-controlled Silskyi Hospodar (Ukrainian SSR) association of farm co-operatives in its place.